Upon arrival in the walled city, transfer to your hotel to freshen up. In the evening you can learn about the history of this important Sikh centre while discovering some lesser-known facts and points of interest on the Amritsar Heritage Walk. Follow the city's narrow lanes and stroll through markets en route to the Golden Temple and see the only gurudwara, or 'gateway to the guru', built by the British in honour of the 21 Sikh soldiers that fought for them against the Afghans in 1897. This evening can be spent at leisure or at an optional Palki ceremony, the worshipping of the Holy Book by pilgrims, at the Golden Temple. Stay: Hyatt Amritsar. This morning visit the spectacular Golden Temple – the spiritual centre of the Sikh faith, which is crowned with an inverted lotus-shaped golden dome. Continue to the sombre Jallianwala Bagh, the site of the tragic Amritsar Massacre in the early 20th Century. Next, put your dexterity to the test during a turban-tying experience. In the early evening you will visit the Wagah Border, the only road border crossing between India and Pakistan, for the elaborate Beating the Retreat ceremony. Stay: Hyatt Amritsar (breakfast included). Rise early to transfer to the railway station for your journey to Delhi on board the Shatabdi Express which leaves at 5am (approx. 6¼ hours). Enjoy breakfast on board and upon arrival in the capital, transfer to your hotel. Explore the city on an afternoon orientation tour which visits the outstanding Jama Masjid Mosque and drives past the 17th-Century Red Fort and the Raj Ghat – a peaceful open-air memorial to Mahatma Gandhi. Stay: Sheraton New Delhi (breakfast included). Embark on a full day of sightseeing, exploring the capital's narrow bustling streets and teeming colourful bazaars of Old Delhi. Visit the UNESCO-listed Humayun's Tomb – the 16th-Century tomb of the Mughal Emperor Humayun which was designed by a Persian architect and was the first garden-tomb on the Indian subcontinent. Continue to Lutyens' New Delhi, which was designed by British architects and features wide roads and sprawling parks – providing a stark contrast after exploration of Old Delhi's labyrinthine lanes. See the India Gate, which is dedicated to the Indian soldiers that lost their lives during World War I, and drive past the monumental government buildings. Stay: Sheraton New Delhi (breakfast included). Rise early for your journey to Agra by road. Visit the UNESCO-listed Agra Fort, an important 16th-century Mughal monument resembling a walled city that is just one-and-a-half miles from its more famous neighbour, the Taj Mahal. Enjoy an afternoon at leisure to relax or join an optional tour to Itmad-Ud-Daulah, also known as Baby Taj. Built in 1622, this stunning tomb is renowned for its intricate inlaid stonework and elaborate carvings. Continue to Mehtab Bagh – a park built by Emperor Babur as the last in a series of 11 parks on the bank of the Yamuna River. This serene park offers enchanting views of the Taj Mahal during sunset away from the crowds. Stay: ITC Mughal (breakfast included). Today there is another early start, this time for an unforgettable visit to the magnificent Taj Mahal, one of the finest pieces of architecture in the world. Built in the 17th Century by the Mughal Emperor Shah Jahan in memory of his queen Mumtaz, this exceptional monument to love has been declared one of the New Seven Wonders of the World. After breakfast, drive to Ranthambore National Park (approx. 6 hours) which covers some 240 square miles of beautiful scenery, boasts one of the country’s leading tiger conservation efforts and is one of the best parks in India to spot this elusive animal. The afternoon is yours to relax or explore Ranthambore at leisure. In the evening enjoy a discussion on the famous tigers with a renowned local naturalist. Stay: Vivanta by Taj - Sawai Madhopur (breakfast and dinner included). Today you can look forward to a morning and evening game drive in the park. You may be lucky enough to spot one of the endangered tigers as you explore the park in shared open top canters, as well as leopards, crocodiles and over 300 species of birds. Stay: Vivanta by Taj - Sawai Madhopur (breakfast, lunch and dinner included). Day 8: Ranthambore to Jaipur. In the morning you have the option of joining another game drive before breakfast. You will then depart the park and enjoy a packed lunch on your journey to Jaipur (approx. 4 hours) which is renowned for its beautiful palaces and forts. In the evening you will have the chance to join a one-hour yoga session with a yoga guru. The origins of this ancient spiritual practice can be traced back to India over 5000 years ago and the opportunity to learn from an experienced guru is not to be missed. Later you will visit a local temple to attend the evening Aarti ceremony – the Hindu ceremony of light. Stay: ITC Rajputana Sheraton (breakfast and lunch included). 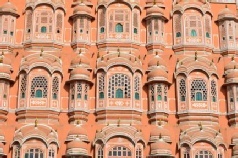 Enjoy a full day of sightseeing in the 'Pink City' of Jaipur. Many of the buildings in India's first planned city were painted pink to welcome the Prince of Wales in 1876. Visit the striking hilltop Amber Fort and the City Palace – an exquisite complex of Rajasthani and Mughal architecture. You will also visit the Royal Observatory and stop for photos outside the unique Palace of Winds, an intricately designed five-storey building that resembles a beehive. Stay: ITC Rajputana Sheraton (breakfast included). Return to Delhi by road for your final night (approx. 6 hours). This evening there is an optional 'Glimpses of Delhi' tour which will include visits to the beautiful Lodhi Gardens, Gandhi Smiriti museum, which is dedicated to Mahatma Ghandi, and the extravagant Birla Temple. Stay: Sheraton New Delhi (breakfast included). Transfer to the airport for your onward journey. Alternatively, choose to extend your holiday (breakfast included). 2019 package holidays escorted tours of India Prices are per person based on two sharing.